The auditions are over! Now, the game truly begins. Tonight was the first night of Season 11’s Judges Cuts. 20 acts must once again face Simon, Heidi, Mel B and Howie to prove they have what it takes to secure one of the spots in the Season 11 live shows at the Dolby Theatre. To assist the judges’ this round, the show called in George Lopez, Reba McEntire, Louis Tomlinson and Ne-Yo to help them with the crucial decision-making process. Just like last year’s guest judges (Neil Patrick Harris, Michael Buble, Marlon Wayans and former AGT judge Piers Morgan), each of them will award a special act—the Golden Buzzer. Ne-Yo joined the panel tonight! Which act received his Golden Buzzer? Who moved on to the Dolby Theatre semi-finals? Read on to find out! 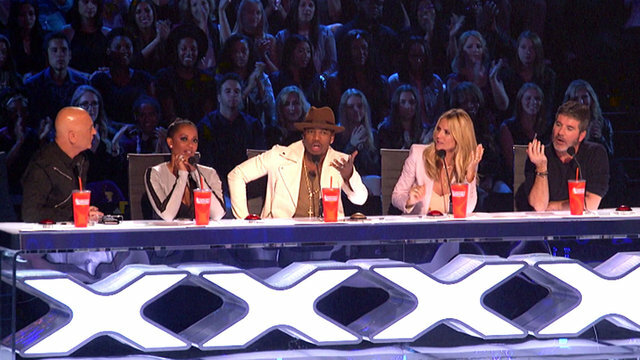 As Nick addressed the 20 acts that were assembled behind the scenes, the judges arrived and welcomed Ne-Yo to the judges’ desk. Ne-Yo revealed that he was looking for acts with passion and was a little bit startled when he hit the Golden Buzzer. Up first to face the judges, Japanese illusionist Hara. He surprised the audience by wearing a Japanese devil mask before bringing out a deadly box that had eight swords attached to it. Just as everyone thought that the iron cage killed him, Hara startled the judges when he teleported appeared in front of him. Ne-Yo revealed that he would watch him in Vegas, and Simon added that he was made for Vegas. Edgar Family Band (Ryan, Nikki Leonti-Edgar and their daughter, Jaslyn) performed the first song that they sang together as a family. They gave a beautiful interpretation of The Beatles’ “Let It Be.” I got goosebumps from the first note, and the trio’s beautiful cover impressed the audience. Mel B stated Nikki’s voice blew her away every time and Howie added that they improved since their first audition. As Ne-Yo revealed his painful experience at Showtime at the Apollo, several of the acts began to crash under the pressure of the Judges’ Cuts. Village People one-man-band Christopher performed “In the Navy” that included a big cut-out of Simon as Uncle Sam. While Mel B stated it was similar to the first audition, Ne-Yo indicated that there was an element of pure comedy. However, Simon said that Christopher was not at the same level of some of the acts they saw earlier. While they waited for their chance, the show’s youngest contestants bonded backstage. 14-year-old Brennley Brown performed a stripped down cover of “Stop! In the Name of Love.” Mel B was impressed with her vocal control, but Simon heard that particular rendition of the song during numerous auditions. Meanwhile, 13-year-old Lori Mae Hernandez joked about the transition between from a child to a tween and nodded at Ne-Yo when she wanted to hot guys to sing Disney songs. Lori Mae also poked fun at Caitlyn Jenner during her routine. Mel B revealed that she would fight for Lori later on during deliberation. Danger act (and husband and wife) Duo Guerrero returned to AGT with a vengeance. First, the wife blindfolded herself and bravely walked on the tightrope carrying the act’s signature wooden chair and balancing rod. Once, she put the chair down, the tightrope walker stood on top of the chair and continued the walk forward. Despite a mini-misstep, she made safely to the other side. Her husband was a little more reckless and danced on the wire before performing double unders. For their last portion, the duo walked across the tightrope together. The performance divided the judges as Mel B was the only judge who thought that the first audition was much scarier! Philadelphia Eagles long snapper Jon Dorenbos returned to perform magic for his chance to move onto the Live Shows. He returned to the Judges’ Desk with a giant set of playing cards. He asked Ne-Yo to play with the cards. The singer chose the five of the clubs from Jon’s deck. Unfortunately, he chose the Ace of Clubs. Before he could got buzzed, Jon revealed that he drew the 5 of clubs on top of the Ace of Clubs. Simon stated that Jon had magic powers and called him a wizard, while Heidi stated that the card trick was amazing. However, Ne-Yo realized his potential, and Jon became the first NFL player to receive the Golden Buzzer from America’s Got Talent. With the Golden Buzzer gone, the other acts had to step up to the plate. The Passing Zone (Jon and Owen) recruited Mel B and (much to his disappointment) Howie. Mel B was swinging on a pendulum while avoiding throwing knives, while the blades hit the target which gave Howie an unwelcomed dunking. It was just absolutely hysterical! The music acts concluded the evening and with impeccable artists such as Julian Davis and the Hay Burners (who I met at the Kansas City auditions) and 62-year-old Ronee Martin. She sacrificed having a family and kids to pursue her dream of becoming a performer. The entertainment law firm assistant belted out Dusty Springfield’s “You Don’t Have to Say You Love Me” and there was not a dry eye in the house. Her vocal performance blew me away and when she hit her falsetto, Ronee took us to church! Howie, Heidi, and Ne-Yo gave her a standing ovation and the “Closer” singer-songwriter stated that talent and the right song supersedes age! Simon compared her to Gladys Knight and Dionne Warwick and stated that the world is going to catch up to her. As Mel B got into a water fight with Simon, 17-year-old danger act Axel Perez tripled his act to make his mom proud. His nerves showed and startled Heidi. He stacked numerous items on top of each other and began to balance and he successfully executed his act. Simon stated that Axel was crazy and nearly gave him a heart attack, while Mel B commented that she felt the danger this time around. One of my favorite acts this season is a cappella quartet Linkin’ Bridge. I fell in love with them when I personally watched their audition at the Pasadena Civic Center in March. For the Judges’ Cut performance, the guys performed Lynyrd Skynyrd’s “Free Bird” and from the first note, their impeccable harmonies gave me chills and they would have made the Southern Rock band extremely proud with their performance. Howie stated that the group showcased their passion and humanity with this performance, Ne-Yo added that their raw passion would take them extremely far in the music industry. Mel B called the performance, “flawless,” and Simon added that they were what he was looking for when he signed on to judge AGT. After Linkin’ Bridge had left the stage, it was time for the judges to make some difficult decisions. They eliminated 13 acts while advancing six more acts to join Jon Dorenbos and the previous Golden Buzzer acts in the next round. Tomorrow night, Reba McEntire joins the “AGT” judges as the next set of cuts begin!